How do I check if the current batch script has admin rights? I know how to make it call itself with runas but not how to check for admin rights. The only solutions I've seen are crude hack jobs or use external programs. Well, actually I don't care if it is a hack job as long as it works on Windows XP and newer. The AT command has been deprecated. Please use schtasks.exe instead. (see screenshot #1) and will return %errorLevel% 1. So, I went searching for other commands that require elevated permissions. rationallyparanoid.com had a list of a few, so I ran each command on the two opposite extremes of current Windows OSs (XP and 8) in the hopes of finding a command that would be denied access on both OSs when run with standard permissions. using AT (Windows 8 incompatible) or WHOAMI (Windows XP incompatible). Each of which have their own security, usability, and portability issues. NET SESSION is a standard command used to "manage server computer connections. Used without parameters, [it] displays information about all sessions with the local computer." Anders solution worked for me but I wasn't sure how to invert it to get the opposite (when you weren't an admin). Rushyo posted this solution here: How to detect if CMD is running as Administrator/has elevated privileges? echo This script must be run as administrator to work properly! echo If you're seeing this after clicking on a start menu icon, then right click on the shortcut and select "Run As Administrator". Works on WinXP --> Win8 (including 32/64 bit versions). EDIT: 8/28/2012 Updated to support Windows 8. @BenHooper pointed this out in his answer below. Please upvote his answer. In this case the %errorLevel% variable will be set to 2. Note The Server service is not started while in Safe Mode (with or without networking). gives correct results even in Safe Mode. The fsutil dirty command requires admin rights to run, and will fail otherwise. %systemdrive% is an environment variable which returns the drive letter where the operating system is installed. The output is redirected to nul, thus ignored. The %errorlevel% variable will be set to 0 only upon successful execution. Queries or sets a volume's dirty bit. When a volume's dirty bit is set, autochk automatically checks the volume for errors the next time the computer is restarted. query           Queries the specified volume's dirty bit. set             Sets the specified volume's dirty bit. <VolumePath>    Specifies the drive name followed by a colon or GUID. The volume is online and it has outstanding changes. Changes were made to the volume and the computer was shut down before the changes were committed to the disk. Corruption was detected on the volume. If the dirty bit is set when the computer restarts, chkdsk runs to verify the file system integrity and to attempt to fix any issues with the volume. While the solution above works from Windows XP onwards, it's worth adding that Windows 2000 and Windows PE (Preinstalled Environment) don't come with fsutil.exe, so we have to resort to something else. a list of the available parameters and their usage. The error output is first redirected to the standard output, which is then piped to the find command. At this point we have to look for the only parameter that is supported in all Windows version since Windows 2000: /SCANNOW. The search is case insensitive, and the output is discarded by redirecting it to nul. Scans and verifies the integrity of all protected system files and replaces incorrect versions with correct versions. You must be logged on as a member of the Administrators group to run sfc.exe. echo Running with admin rights. fltmc command is available on every windows system since XP so this should be pretty portable. Echo here you are not administrator! Echo here you are administrator! With this trick you don´t need longer to right klick on your batch file "with admin rights". If you have forgotten, to start it with elevated rights, UAC comes up automatically! Moreoever, at first it is tested, if the OS needs/provides UAC, so it behaves correct e.g. for Win 2000/XP until Win 8.1- tested. rem Program will now start again automatically with admin rights! I have two ways of checking for privileged access, both are pretty reliable, and very portable across almost every windows version. This is one of the most reliable methods, because of its simplicity, and the behavior of this very primitive command is very unlikely to change. That is not the case of other built-in CLI tools like net session that can be disabled by admin/network policies, or commands like fsutils that changed the output on Windows 10. Sometimes you don't like the idea of touching the user disk, even if it is as inoffensive as using fsutils or creating a empty folder, is it unprovable but it can result in a catastrophic failure if something goes wrong. In this scenario you can just check the registry for privileges. For this you can try to create a key on HKEY_LOCAL_MACHINE using default permissions you'll get Access Denied and the ERRORLEVEL == 1, but if you run as Admin, it will print "command executed successfully" and ERRORLEVEL == 0. Since the key already exists it have no effect on the registry. This is probably the fastest way, and the REG is there for a long time. * It's not avaliable on pre NT (Win 9X). REM   only permits SYSTEM and Administrators. This method only uses CMD.exe builtins, so it should be very fast. It also checks for the actual capabilities of the process rather than checking for SIDs or group memberships, so the effective permission is tested. And this works as far back as Windows 2003 and XP. Normal user processes or nonelevated processes fail the directory probe, where as Admin or elevated processes succeed. The following tries to create a file in the Windows directory. If it suceeds it will remove it. Note that 06CF2EB6-94E6-4a60-91D8-AB945AE8CF38 is a GUID that was generated today and it is assumed to be improbable to conflict with an existing filename. This is tested for Windows 7, 8, 8.1, 10 and even Windows XP and does not need any resource such as a special directory, file or registry key. When running in this state, if IsUserAdmin (https://msdn.microsoft.com/en-us/library/windows/desktop/aa376389(v=vs.85).aspx) returns FALSE and UAC is fully disabled, and GetTokenInformation returns TokenElevationTypeDefault (http://blogs.msdn.com/b/cjacks/archive/2006/10/24/modifying-the-mandatory-integrity-level-for-a-securable-object-in-windows-vista.aspx) then the process is not running elevated, but whoami /groups claims it is. You should do net session twice because if someone did an at before hand, you'll get the wrong information. Some servers disable services that the command "net session" requires. This results in the admin check always saying you don't have admin rights when you may have. Edit: copyitright has pointed out that this is unreliable. Approving read access with UAC will allow dir to succeed. I have a bit more script to offer another possibility, but it's not read-only. In Windows 7 it will errorlevel with "1" with info that "Target system needs to be 32bit operating system"
Both check will probably also fail in recovery console. echo UAC.ShellExecute "cmd.exe", "/C %~s0", "", "runas", 1 >> "%temp%\getadmin.vbs"
Literally dozens of answers in this and linked questions and elsewhere at SE, all of which are deficient in this way or another, have clearly shown that Windows doesn't provide a reliable built-in console utility. So, it's time to roll out your own. The following C code, based on Detect if program is running with full administrator rights, works in Win2k+1, anywhere and in all cases (UAC, domains, transitive groups...) - because it does the same as the system itself when it checks permissions. It signals of the result both with a message (that can be silenced with a switch) and exit code. It only needs to be compiled once, then you can just copy the .exe everywhere - it only depends on kernel32.dll and advapi32.dll (I've uploaded a copy). 1MSDN claims the APIs are XP+ but this is false. CheckTokenMembership is 2k+ and the other one is even older. The last link also contains a much more complicated way that would work even in NT. Write-Host "User is in '$Role' role"
The MODE CON reinitializes the screen and surpresses any text/errors when not having the permission to write to the system location. Alternative: Use an external utility that is designed for this purpose, e.g., IsAdmin.exe (unrestricted freeware). if %errorlevel%==0 (echo You're elevated!!! Users will be annoyed with many more than 1 lines without this. Point where the program starts. Set the filename of the directory to be created. Creates the directory on <DL>:\Windows (replace <DL> with drive letter). 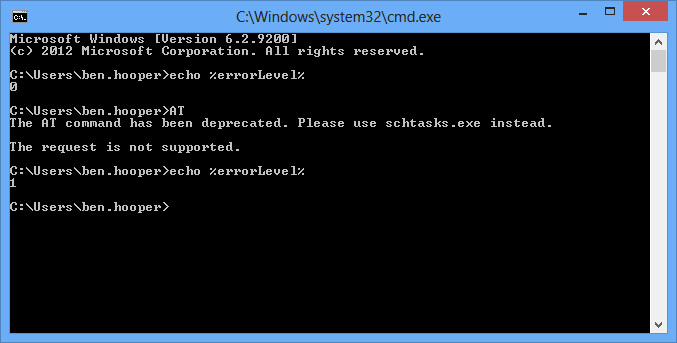 If the ERRORLEVEL environment variable is zero, then echo success message. Go to the end (don't proceed any further). If ERRORLEVEL is one, echo failure message and go to the end. In case the filename already exists, recreate the folder (otherwise the goto end command will not let this run). Pause so the user can see the message. Note: The >nul and 2>nul are filtering the output of these commands. for %%a in (%today%) do set "today=%%a"
I found a user that can use net session even though they are not admin. I didn't look into why. My workaround is to test if the user can make a folder in the windows folder. echo Your script entered the :testadmin function by error. Usage: "call :testadmin"
echo User IS NOT admin. :: or use "pause" instead of "timeout"
I needed a batch to run within a Domain environment during the user login process, within a 'workroom' environment, seeing users adhere to a "lock-down" policy and restricted view (mainly distributed via GPO sets). A Domain GPO set is applied before an AD user linked login script Creating a GPO login script was too per-mature as the users "new" profile hadn't been created/loaded/or ready in time to apply a "remove and/or Pin" taskbar and Start Menu items vbscript + add some local files. The users have multiple machines within the domain, where only these set 'workroom' PCs require these policies. These folders require 'Admin' rights to modify, and although the 'Domain User' is part of the local 'Admin' group - UAC was the next challenge. Found various adaptations and amalgamated here. I do have some users with BYOD devices as well that required other files with perm issues. Have not tested on XP (a little too old an OS), but the code is present, would love feed back. :: no warranty, obligations or liability for any Sample Application Files. ::* Distributed under a "GNU GPL" type basis. ::* 1.0.0 - 08/10/2013 - Created. ::* 1.0.1 - 09/10/2013 - Include new path creation. ::* Goto:Secpol, edit out Exit, modify .inf set, export as "Wins8x64.inf"
:: Del /F /Q "Bespoke.cmd"
reg query "HKEY_LOCAL_MACHINE\SOFTWARE\Microsoft\Windows\CurrentVersion\Policies\System" /v ConsentPromptBehaviorAdmin | Find /i "0x5"
echo Set objShell = CreateObject^("Shell.Application"^) > "%temp%\getadmin.vbs"
echo objShell.ShellExecute "%~s0", "", "", "runas", 1 >> "%temp%\getadmin.vbs"
Domain PC's should be governed as much as possible by GPO sets. Workgroup/Standalone machines can be governed by this script. Remember, a UAC prompt will pop-up at least once with a BYOD workgroup PC (as soon as the first elevating to 'Admin perms' is required), but as the local security policy is modified for admin use from this point on, the pop-ups will disappear. A Domain PC should have the GPO "ConsentPromptBehaviorAdmin" policy set within your 'already' created "Lock-down" policy - as explained in the script 'REFERENCES' section. Again, run the secedit.exe import of the default '.inf' file if you are stuck on the whole "To UAC or Not to UAC" debate :-). By running only "%SYSTEMROOT%\system32\cacls.exe" or "%SYSTEMROOT%\system32\config\system" or both from the command prompt - elevated or not, check the result across the board. echo Alternatively, a single run "Run as Administrator"
Not the answer you're looking for? Browse other questions tagged windows batch-file cmd admin or ask your own question. How to detect if CMD is running as Administrator/has elevated privileges? Do high-integrity tokens *have* to have the Administrators group enabled?